I'm trying a new crockpot recipe I have varying success with crockpot things, but I wanted to have something going that would not require me to heat up the kitchen too much later this evening. I had some skin-on, bone-in chicken breasts in the freezer (they were on sale) and so I found a kind of spicy Italian recipe that would only require me to make some spaghetti later to serve this over. I have no idea if it will be any good, but it's worth a try. Meanwhile, I'm waiting for Mason to wake up so that I can take him off for his second driver's lesson. We tried out a parking lot yesterday. He did actually very well, considering it was his first real time. The first few stops were panicked and jerky, but by the time we were done, he was getting the hang of a smooth stop. Turning was still a little baffling for him, until I took the wheel for a while and realized that part of the problem was that the wheel needs a certain amount of acceleration in order to turn itself back to true. The other big thing we did for Mason yesterday was get him a teen checking account. He now has his own debit card. He'll have the ability to check his own statements on-line, etc. Shawn found him a check register, so he can keep track of his finances the old fashioned way, too. We are doing our best to get our teen ready for adulting, as the kids say. I'm really glad we're starting some of this stuff now, when he'll still have plenty of time at home to work out any kinks, as it were. Plus, I'm hoping that it will ease some of the natural desire for independence at this age. He'll have a good deal of freedom and discretion when it comes to his own money, and, eventually, he'll have the physical freedom to take the car to places. Oh, that reminds me. I'd better call our insurance company and get him added to our policy. That'll be... expensive. K. Have to keep it short for now. I've got to prep for class. But, when I return, I should have stories of that as well as a podcast. I am so amazing and busy, you can hardly keep up with me, can you? Today is Tuesday which is my super-duper productivity day. I've posted a new installment over on Wattpad: http://www.wattpad.com/76031780-unjust-cause-part-26-choices-made. In this chapter, Alex thinks she's got everything figured out. So, of COURSE, the universe throws her a curveball... in the form of one Spenser Jones. Also, Rachel Calish/Gold and I have updated our School for Wayward Demons, which you can read here: http://entertheunseen.com/01-06-everyone-catches-up-to-theo/. In this chapter, the demons finally catch up to our cheeky thief, Theo. Will she manage yet another daring escape? Tune in to find out! I reviewed a couple of things up on MangaKast, too, in case you were curious about how I felt about the latest Ao no Exorcist chapter (61) http://mangakast.wordpress.com/2014/10/13/ao-no-exorcist-61/ or its spin-off Salaryman Futumashi Okumura Yukio no Aishuu http://mangakast.wordpress.com/2014/10/11/sorrows-of-the-salaryman-exorcist/, which, in my opinion, has the best tag line in the history of strange manga tag lines, ever: "This is my seriousness!" Because there was an adult (beyond me) present, the two kids took some warming-up. Plus, the whole point of Open Pages is that the class is supposed to self-direct, so I intentionally come under-prepared, with the idea that if the consensus is "We want to talk about how hard plotting is!" then we do that. But, mouths stayed firmly shut in the presence of another grown-up, so I had to run though that list y'all gave me of 'fan fic pet peeves." Luckily, my teaching style (chaotic good) lends itself to interruption and discussion, so going through that list seemed to spark thoughts, etc., and by the end there was a lot of chatter among the three of us. Also, one of the students boldly asked for time to write, so we spent the last half hour doing just that. I never know with these things, but it felt, to me, ultimately, successful. Probably that means I bombed. I'm constantly surprised by why teens take a class on fan fic... and the levels that they come in at. Like last night, I had one student who didn't entirely seem clear on the concept. When it came time to write, she needed much more than a prompt. She seemed confused as to the point of fan fic, event though we'd been talking about it for about an hour. I explained that some people use fan fic to fill in the corners of a story--the bits you don't get to see, but might like to. So, for instance, if she wanted she could try writing about two of her favorite characters doing something mundane, such as grocery shopping or shopping for shoes. She seemed to thinks this was silly, since most of the time the heroes were in a life-or-death situations. When would they have time to shoe shop? I said, see, that's kind of the point. To take them out of the the plot and see what they're like in their ordinary life. But, then again, I said, not everyone likes curtain fic. So, maybe instead, I suggested, you could do a fix-it about something that bothered you in the story that you wanted to change or write something that happened after canon had finished... like the story of what Harry Potter is doing with his life after school. Finally, she seemed to settle on something, but it was kind of baffling to me, especially in comparison to my other student who not only instantly started writing, but also said that they had a FanFictionnet that they'd been active on until they forgot their password. So... two VERY DIFFERENT students. On Monday, October 13 from 6:00-7:30 pm I'll be the Loft's "First Pages" instructor for "Writing Fan Fiction" a program for teens at the Savage Library. The library is located at 13090 Alabama Ave South, Savage, MN. The program description reads: Do you long to carry on the amazing story lines of your favorite novels, and live with your most treasured characters beyond the final page of the final chapter? That's what fan fiction is for! Learn how to carry on your favorite story lines--and invent your own--in this engaging class on extending the lives of your favorite characters. The program description reads: Some people might tell you that writing fan fic is 'easier' because so much has already been established in terms of characterization and world-building. The people who say that, however, probably haven't actually tried it. The truth is, fan fiction requires all the same skills as writing anything, plus the author has to be constantly aware of canon and how it reflects on what they're writing (even AU), as well as readers who might scream OOC! This workshop will give you pro tips on how to improve your writing in general and in specific to fan fic's quirks from the perspective of someone who is not only a professionally published author, but also a prolific fan writer as well. As part of this workshop, we will practice beta reading for each other with an eye on setting, themes, conflict, and sensory details. My friend Rachel Gold and I will be co-teaching: "Using Fan Fiction to Improve Your Writing" on Wednesdays, 6-8 p.m. from January 21 to February 25, 2015--which will be part of the Loft's winter course catalogue. Technically, we're waiting for Rachel to confirm, but I wanted to get this info out there so that people can plan ahead. The Loft classes can be pretty pricey, but keep in mind there are always a few, limited number of scholarships available. First, though, Tate has updated UnJust Cause : http://www.wattpad.com/55131739-unjust-cause-part-12-the-innocence-of-dragons. I doubt a lot of you are going from here to there, but I feel the need to, you know, social media this so if it fails, it isn't because I didn't get the word out. When Shawn and I started talking about all the things surrounding marriage, we brought up the idea of a honeymoon while we were all having dinner. Mason got this bright look in his eyes, clasped his hands together, and declared, "Oh! I've always wanted to go to Paris!" So for us, there was never any question that Mason would be coming along on our honeymoon. Perhaps you'll say we're doing this wrong. But, the truth of it is, Shawn and I had nearly twenty years of a honeymoon before Mason came along. And, really, at this point, it's not so much about snogging like bunnies so much as it is having an excuse to spend some serious money on a family trip. We didn't pick Paris because that's a little out of our price range. Mason's other suggestion had been a long weekend at the Waterpark of America, but that seemed not quite "celebratory" enough for us. So, we went to Bearskin Lodge, just up the Gunflint trail, for a WHOLE WEEK. 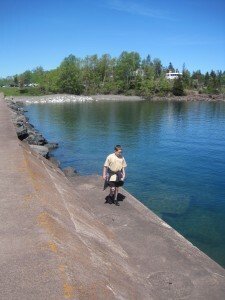 As part of that, we meandered our way along the north shore of Lake Superior and stopped at all the beaches and sights that interested us. The first time we made the trip to Bearskin in 2010, we brought along a book Shawn had picked up from the History Center called "61 Gems on Highway 61." We brought that along again because it had steered us to some very lovely and memorable sights. 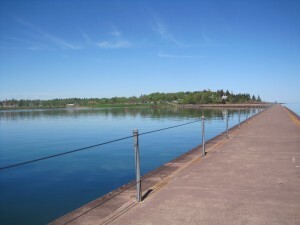 First stop was the break wall in Two Harbors. Break walls/safe harbors are kind of fascinating. On a clear day, like this one, it seems kind of useless: a big long, somewhat ugly looking structure built out into the water. But on our drive back when the wind was crashing HUGE waves against the shore we stopped at the Grand Marais break wall and the difference was... astounding. One side of the wall was getting HAMMERED by the waves; the opposite side? The sail boats in the harbor barely bounced in the calm. Science, man. It's kind of amazing. Okay... that's not much, but all for this time because my internet is being wonky with the pictures. I'll have more for you tomorrow, though! Now I'm off to teach my second day of "More than the Zombie Apocalypse." Wish me luck!